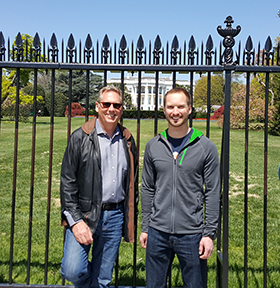 On March 21, 2017, PNCWA Government Affairs committee members Bob Baumgartner, John Beacham, Mike Ollivant flew into Washington, D.C. for the annual WaterWeek Fly-In, where water representatives from all over the country gather to talk water infrastructure and funding. 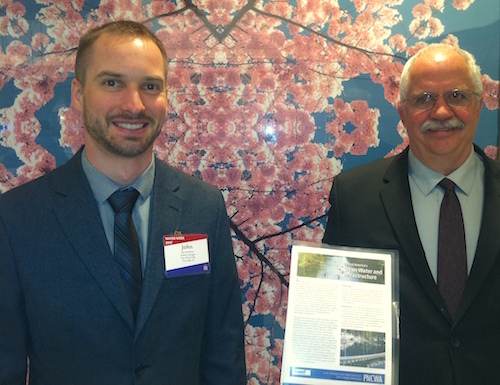 In “WaterWeek Part 1: PNCWA Members Report on National Policy,” we reported on national policy discussed. Thanks to a very generous offering and donation from UBOS (Umpqua Basin Operators Section), the PNCWA scholarship program has recently added two new funds that will award scholarships to applicants interested in the field of operations. PNCWA’s main scholarship fund, in existence since 2010, has always been open to applicants interested in pursuing studies in both the engineering and operations fields (and will continue to be), but the two newly established funds will accept only applications from candidates involved in studies related to operations. Scholarships are now open and applications are due June 23, 2017. Read more at our "Scholarships" page. 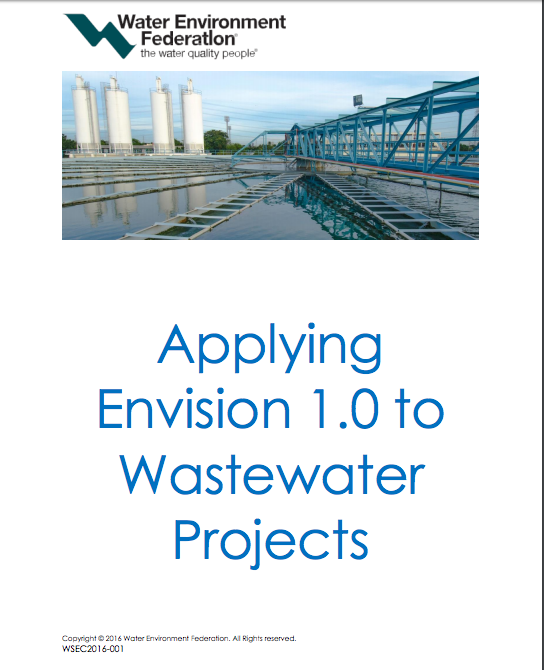 The Institute for Sustainable Infrastructure (ISI) Envision rating system as been around for about five years and is gaining traction as the premier sustainability rating system for the wastewater industry. ISI was founded by the American Public Works Association (APWA), the American Society of Civil Engineers (ASCE), and the American Council of Engineering Companies (ACEC) and operates under their oversight. ISI collaborated with the Zofnass Program for Sustainable Infrastructure at the Harvard University Graduate School of Design to develop Envision. Envision is a rating system for sustainable infrastructure. It measures a project’s impact on the surrounding community and environment plus technical considerations regarding materials and processes while providing a framework for discussing sustainability decisions with project stakeholders and community. Not only is it a planning and design tool, it also is a means of evaluating completed infrastructure projects. The PNCWA Odor & Air Quality committee is presenting a two-hour webinar on May 3rd, 2017 on several topics. The webinar is no-cost to PNCWA members. Scroll down for a complete webinar schedule. Click here to register for the webinar today! .2 CEU's requested. 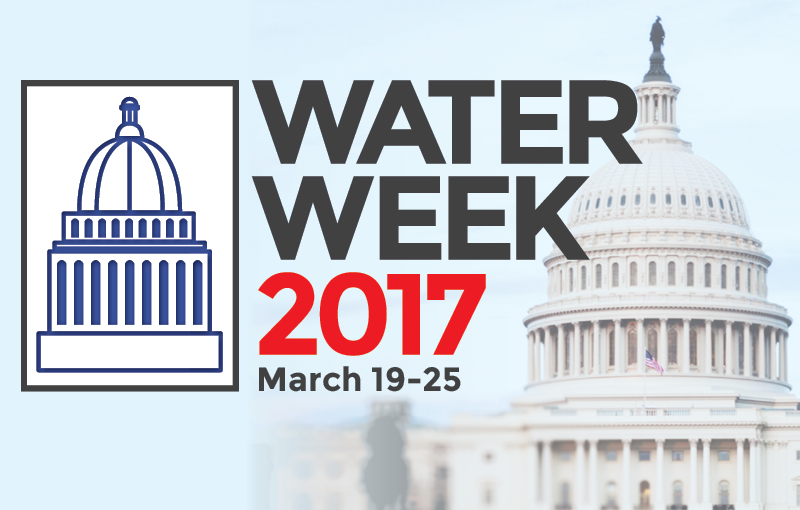 On March 21, 2017, Bob Baumgartner, John Beacham, Mike Ollivant of the PNCWA Government Affairs committee flew into Washington, D.C. for the annual WaterWeek Fly-In, where water representatives from all over the country gather to talk water infrastructure and funding. This year felt different than most. Capitol Hill was abuzz with the American Health Care Act in the House and the confirmation hearings for Judge Gorsuch as a Supreme Court Justice. Closely behind was the release of the president’s “skinny” budget— a proposed budget consisting of top-level line items for federal programs but without specific details. Of interest to PNCWA was a proposed 31% cut to the EPA budget, which did not include any cut to SRF funding, and the removal of the line item for USDA Rural Development funding, which is often used to finance infrastructure projects for smaller municipalities. This year’s national Residual and Biosolids Conference is taking place in Seattle, Washington, from April 8-11. Many members from the PNCWA Residuals & Biosolids Committee are attending and involved as conference organizers, presenters, and moderators. “The committee is taking advantage of this opportunity to participate more than we could at a more distant conference,” says Susan Hildreth, PNCWA Residuals & Biosolids Committee Chair. “We’re having an unusually good turnout at a national conference because it’s local.” PNCWA is also cohosting a Friends of Biosolids Reception at the Museum of Pop Culture (pictured left) on opening night of the conference—and tickets are still available! On Wednesday, March 22, 2017 in Seattle, Washington, the EPA is hosting a free workshop to assist with adaption and long-term infrastructure planning related to utility resilience planning. During the one-day, no-cost training, participants will learn how changing environmental conditions and extreme weather events in the Pacific Northwest could impact their utilities. Participants will also explore potential vulnerabilities to water infrastructure and strategies for reducing risk and enhancing utility resilience. The workshop is designed for participants who make or influence planning and resource allocation decisions within drinking water, wastewater, or stormwater utilities and from governmental agencies who work with water utilities. Participants will learn about tools and resources available through the Creating Resilient Water Utilities (CRWU) initiative and CREAT, a risk-assessment application that helps utilities in adapting to extreme weather events through a better understanding of current and future weather conditions. 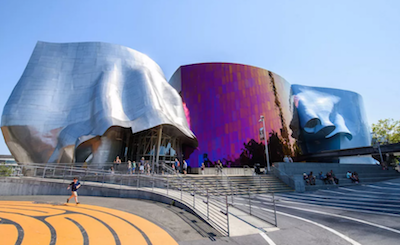 This conference is held by the Water Environment Federation in cooperation with the Pacific Northwest Clean Water Association and Northwest Biosolids. The Water Environment Federation's Residuals and Biosolids Committee is pleased to announce the 2017 Residuals and Biosolids conference in Seattle, Washington. The conference will cover a variety of topics including bioenergy. The super saver rate ends March 10! Click here to attend the reception or register to be a sponsor. Water Sector Unites to Elevate Water as a National Priority; PNCWA Government Affairs Committee members participate in Congressional meetings. WASHINGTON - The U.S. Environmental Protection Agency (EPA) announced the availability of approximately $1 billion in credit assistance for water infrastructure projects under the new Water Infrastructure Finance and Innovation Act (WIFIA) program. EPA’s WIFIA program will provide long-term, low-cost credit assistance in the form of direct loans and loan guarantees to creditworthy water projects. WIFIA provides another option for financing large infrastructure projects – generally at least $20 million – in addition to the State Revolving Funds and bond market. WIFIA is available to state, local, and tribal governments; private entities; partnerships; and State Revolving Fund programs. EPA estimates that funds appropriated to the WIFIA program can be leveraged at a ratio greater than 50 to one, which means the $17 million program budget could allow EPA to make approximately $1 billion in loans and stimulate about $2 billion in total infrastructure investment. Struvite recovery webinar presentations are now available! Struvite Recovery at Durham and Rock Creek Wastewater Treatment Facilities (WWTF), OR (PDF) by Peter Schauer, Clean Water Services, OR. The presentation will discuss the history of the first struvite recovery facility in United States that was opened at the Durham WWTF in 2009, and the struvite recovery facility that opened in 2012 at the Rock Creek WWTF. Updates on the recent operations will be provided. Struvite Recovery at West Boise WWTF, ID (PDF) by William Benko and Ron Gearhart, City of Boise, ID The presentation will highlight the latest operational requirements and optimization of the struvite production facility and the impacts from the 2015 startup of the enhanced biological phosphorus removal (EBPR) improvements constructed at the West Boise WWTF, as well as from Launder Street WWTF’s 2015 conversion from a chemical phosphorus removal plant to an EBPR plant. After 30 years with the city of Coeur d’Alene, Wastewater Superintendent Sid Fredrickson will retire at the end of 2016. The city will host a public open house in honor of Fredrickson from 12:30 to 2:30 p.m. Dec. 14 at the city of Coeur d’Alene Library Community Room, 702 E. Front Ave. Fredrickson joined the city in November 1986 as the street department superintendent and began his tenure with the city's Wastewater Department in 1991. WASHINGTON – Today the U.S. Environmental Protection Agency (EPA) launched its fifth annual Campus RainWorks Challenge, a competition for college and university students to design innovative solutions for our nation’s water infrastructure. Using their campuses as labs, teams develop green infrastructure systems to reduce stormwater pollution and build resilience to climate change. Since 2012, more than 420 student teams have participated in the challenge. WEFTEC 2016 is hosting the fifth annual Ingenuity Contest. This competition recognizes that some innovations come not from a research lab but from the need to tackle a persistent problem with nothing more than the materials at hand and a hearty dose of ingenuity with a tweak here or a little fix there. WEFTEC will showcase these imaginative, inventive, and effective ways you’ve found to overcome those pesky problems. Selected inventors will be invited to give 10-minute presentations. The competition is open to all clever ideas related to treatment processes, collection systems, laboratory practices, stormwater, administration, human resources, you name it. The bottom line: Even if you’re not sure that your innovation qualifies, submit it. Even if you can’t come to WEFTEC, please submit your idea as we will share them with lots of people! PNCWA is in its third year of hosting a midyear meeting for Committee Chairs and Board members to come together. The Midyear Meeting primarily provides an opportunity for key volunteer committees to meet face-to-face with PNCWA Board members for a general check-in, to review where Committees are on Committee initiatives proposed by them in their 2016 budgets, and and to discuss future programming and initiatives under the ► PNCWA Strategic Plan. As a membership organization, PNCWA understands the value of member engagement and using the collective knowledge of an entire profession to further its mission of improving water quality around the world. PNCWA members who participate in PNCWA committee activities help develop conference programs, develop training materials and program content, and many other PNCWA program activities. PNCWA Membership is required for committee participation. ► Click here to apply to join a PNCWA Committee. A growing number of communities around the world grapple with environmental challenges of scarce natural resources, foul air, and polluted waterways. But thanks to decades of research, many have recognized value hiding in urban waste streams and are developing safe and effective products captured from the wastewater treatment process. PNCWA and the PNCWA Government Affairs Committee sent three PNCWA members to WaterWeek 2016 in Washington D.C. (April 10-16). Participants met with members of Congress and/or their staff where they shared with them the Water Quality priorities for PNCWA members. 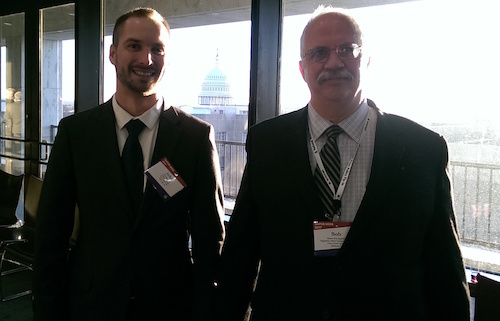 Pictured are Mike Ollivant (Parametrix) who represented the State of Washington, and John Beacham (City of Post Falls) who represented the State of Idaho. Bob Baumgartner (not pictured, Clean Water Services) was there for PNCWA and the State of Oregon! Learn more about Water Week at ► http://www.waterweek.us/us/. PNCWA Volunteers needed to judge research papers! The competition is open to any high school student in grades 9-12, and are 15 years of age by August 1st of the competition year. All research papers must be uploaded online no later than April 15th of each year to compete in their state’s competition. All state winners will receive an all-expenses paid trip to the SJWP National Competition. The national winner will receive $10,000 and an all-expenses paid trip to Stockholm, Sweden to participate in the SJWP International Competition. Click here to learn more about the SJWP competition. PNCWA members wishing to volunteer to judge research papers should contact Catherine Chertudi, SJWP Coordinator for PNCWA: ► [email protected] or by phone: 208.384.3912. The PNCWA Board is creating a calendar for 2017. PNCWA is a family of outstanding professionals who work hard to protect the environment and recover our resources. We would like to highlight the people, projects, and facilities that show the best of our industry in the Pacific Northwest. The types of photos we are looking for include your wastewater facility, pump/lift station, stormwater infrastructure, or collection system. The photos can include both completed or in construction facilities. While facilities and infrastructure are fascinating, they don’t tell the whole story—This calendar will also highlight the people who operate those facilities. So please include photos of laboratory, operations and maintenance staff as well. Be creative, be silly, be yourself. This calendar is intend to be a celebration of our industry and the work we all do as professionals protecting our most important resource: water! 1) The photo must show water quality infrastructure and/or people from the Pacific Northwest. 2) The photo must be owned with no copyrights attached or where permission can be granted to PNCWA. 3) The photo must be digital and a printable quality of at least 300 dpi. Submit your digital photo via email to ► [email protected] with caption and description.